The Backbone provides little structure above simple routing, individual models, views and their binding. Chaplin addresses these limitations by providing a light-weight but flexible structure which leverages well-proven design patterns and best practises. However, as we distribute functionality of some pages over multiple bundles (several bundles can extend a page with own functionalities), we had to extend Chaplin approach for our needs. This is not the whole list, but only the main items that make the skeleton of the client. Most of these libraries are placed in OroUIBundle (as the bundle which is responsible for the user interface). Each of these libraries is defined as a module in RequireJS config with short module_id, so there is no need to use the full path every time (e.g. the module_id is jquery instead of oroui/lib/jquery). File structures and naming conventions use best practices of Backbone development adopted for Oro needs. Modules that fully support Chaplin architecture are placed in app folder. As a results, a controller and all of its models and views exist only between navigation actions. Once the route is changed, the active controller gets disposed as well as all of its nested views and related models. A new controller is created for the current route, and new views and models are created in the new active controller. This approach of limited lifecycle of application components solves memory leak issues. The rest of components, such as application itself, router, dispatcher, layout and composer (see picture above) exist all through the navigation. To cover our needs we had to extend this solution. In OroPlatform a page content is define with one bundle and might be extended with many other bundles. This way, there isn’t a single place where a client side controller can be defined. As a solutions, we have an only PageController constructor used to create controllers for every url. 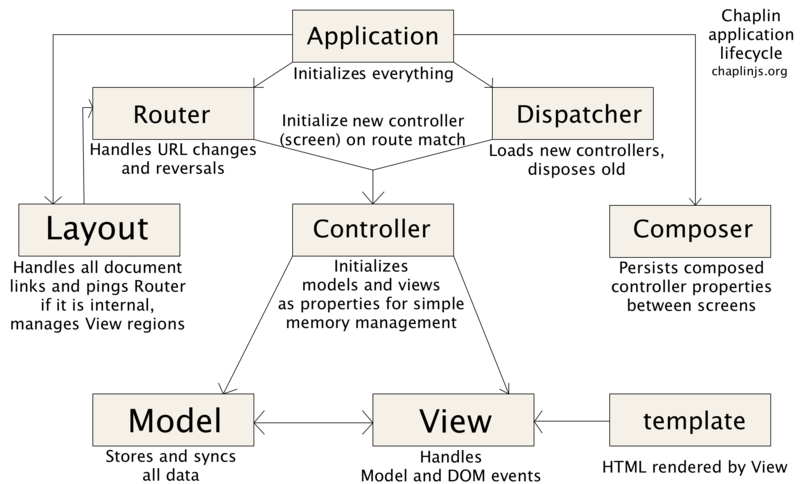 This way, the disposed and created controllers for each navigation action are instances of the same constructor, which exist in different lifecycles of the application. This PageController loads page content over PageModel and sends series of system events to notify the environment that the page content has changed. These events are handled by global views (view components that exist throughout the navigation and are not deleted by a page change). One of them is PageContentView that listens to page:update and updates page content area with HTML from PageModel. After the page:update, the active controller executes layout:init handler that, among other things, runs initialization declared in the HTML PageComponents. As soon as layout:init handler has finished all of its jobs, page:afterChange event is triggered. As functionality of a page depends on its content, which is generated by multiple bundles, we cannot use a single controller responsible for it. We have introduced an alternative approach that allows the use of multiple controllers, each of which is responsible for certain functionality and related to a certain part of the HTML. Such controllers are named Page Component. 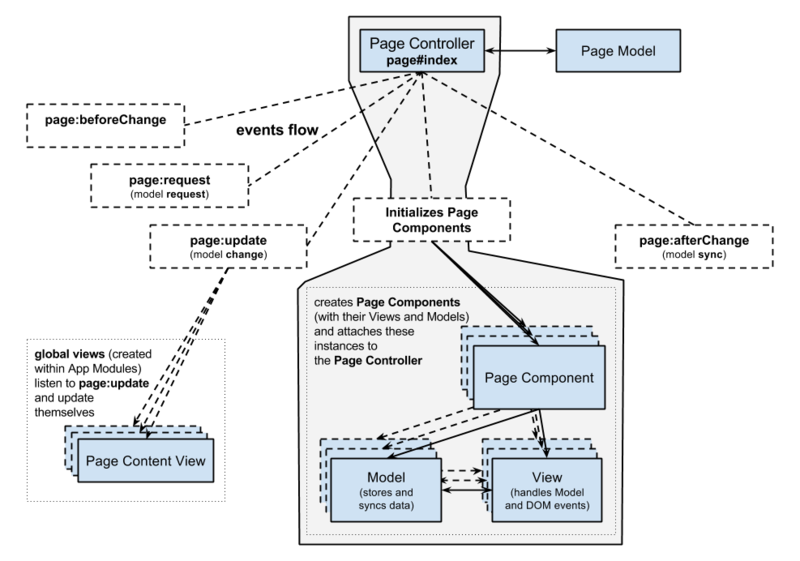 Functionally, a “Page Component” is similar to a “Controller” component in Chaplin, however it implements a different flow : “Controller” represent one screen of the application and is created when the page url is changed, while “Page Component” represents a part of the page with certain functionality and is created in the course of the page processing, subject to the settings declared in HTML. PageController handles this promise and attaches all the components received to itself, in order to dispose them once the controller is disposed. For more details see Page Component documentation. App Modules are not actually modules in the terms of RequireJS, as they export nothing. It’s requirejs() call, executed right before the application is started. It’s called App Module because it makes the whole application modular. These modules are loaded right before instantiation of the Application and makes the whole functionality distributed among the bundles ready to work. This way you can define the code to be executed at the application start for every bundle. oroui/js/app/modules/views-module – declares the global views that will be instantiated right before the “action point” method of the control is invoked. BaseController.addToReuse – a wrapper over the reuse method of Chaplin.Composer. This static method fills the internal array with arguments and applies them to reuse method, when the beforeAction method of active controller is invoked. This way we guarantee that all the necessary handlers are declared before they are used. The handlers can be executed by any component or view in the Chaplin lifecycle. For more details see Chaplin documentation and Client Side Architecture.